Hair loss and thinning can be very difficult for some people to manage. It can happen for a number of reasons to varying degrees. There are several options that are very accessible to help manage your specific needs. The average hair loss usually ranges from fifty to a hundred strands a day. Unfortunately, we’re all prone to hair loss. Everyone experiences it to some degree because normal hair loss works like the body shedding dead skin cells to make room for new ones. Despite its natural occurrence, lost hair that doesn’t regrow makes hair thin and can create bald spots. Over time, it can result in a receding hairline. Sudden hair loss in large amounts can be shocking. No one wants to see large amounts of hair on the floor or on their pillow when they wake up, or a bald spot when they look in the mirror. Knowing the root cause of your hair loss will give you a better understanding of how to treat it. Many of the causes of hair loss and thinning are outside our control. The good news is, there are some that are not. Two that come to mind are (1) a nutritional imbalance and (2) vitamin deficiencies. There are many reasons you may find yourself deficient in a vitamin or mineral essential for healthy hair. Changes in weight, health or a recent surgery may be the cause. If you are not quite sure why your hair is thinning. You should consult your doctor. Hormonal changes or stress can alter anyone’s hair growth. Childbirth and menopause can have a great impact on the growth and integrity of your hair. Hormonal changes can make your hair thinner or halt its growth. Stress is one of the leading causes of hair loss. It can happen suddenly and become severe if not addressed. Frequent hair coloring and bleaching can be very harmful to hair. The chemicals in these products can cause dryness and breakage close to the root. In some cases, hair loss. Fortunately, there are a number of ways to repair damaged hair and counter hair loss. A balanced diet can have a huge impact on your life. It not only improves your overall health, but can replace some of the essential vitamins and minerals needed to keep your hair healthy and growing. Foods such as cashews, walnuts, spinach, salmon, greek yogurt and liver have been known to promote hair growth and increase elastin. A lack of protein is a known preventable cause of hair loss. Lean meats, lentils and beans, whole grains such as quinoa and buckwheat are all great sources of protein to add to your diet. Vitamins and minerals are very important in maintaining hair growth. If you are not getting what you need from your diet, supplements are a great way to boost your intake of the essentials needed for healthy, thick hair. Biotin is a great supplement that can strengthen hair. It has been known to promote hair growth and increase elastin, which keeps your hair from breaking. Iron, magnesium and Vitamin E are also much needed vitamins to promote and maintain healthy hair growth and thickness. If protein is what you are lacking, shakes rich in it are something to consider. Not all vitamins are helpful. For instance, large quantities of Vitamin A may cause hair loss, so beware. Anti-hair loss and hair thickening products are one of the most widely used methods to manage hair loss and thinning. These products promote regrowth and revitalization. There is no shortage of anti-hair loss products available. Investing a little bit of time to find the best hair thickening shampoo or that works for you is a smart investment. Here are five anti-hair loss formulas to help you bring your hair back to life. One of the leading brands in hair care treatments is Pura d’Or. They have one of the best anti-hair loss shampoos and conditioners in the industry. Their Gold Label Regimen is a shampoo and conditioner designed to fight against hair loss. Manufactured proudly in the USA, Pura d’Or Gold Label Regimen is a natural way for anyone who wants to repair his or her hair. It’s hypoallergenic, doctor-trusted, color-safe, and cruelty-free. There were no animals harmed in the process of making this superb shampoo and conditioner. Instead, it uses an all-natural formula trusted by doctors to create a way to rejuvenate all hair types. It won’t matter if hair is curly, straight, or wavy. The Gold Label Regimen works like a charm. It can aid in hair loss by strengthening hair and giving it a better overall health. It has no chemicals that can harm hair. 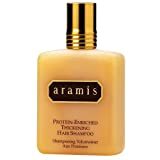 Some shampoos contain parabens and sulfates that can make hair coarse and dry, but now with the Gold Label Regimen. It has 17 amazing, active ingredients fit to improve each strand of hair. It’s also great to know that the shampoo and conditioner work well with daily use. Despite being a hair care treatment, it isn’t too strong for everyday use. Anyone who suffers from hair loss can appreciate the wonderful effects of Pura D’Or Gold Label Regimen. It’s a safe and trusted formula designed to counter hair loss. It might not be the most affordable way to aid in hair regrowth and revival, but its high-quality standards and proven formula make everything worth it. The fragrance could use some time to get used to, but it won’t matter when results can be seen. The Gold Label Regimen works for all hair types and all hair colors. It’s a great way to fix hair and give it its natural glow. No one knows hair care like L’Oreal. It’s an established brand built in promoting state-of –the-art hair care products and high-quality cosmetics. It’s a global superpower in the beauty industry. 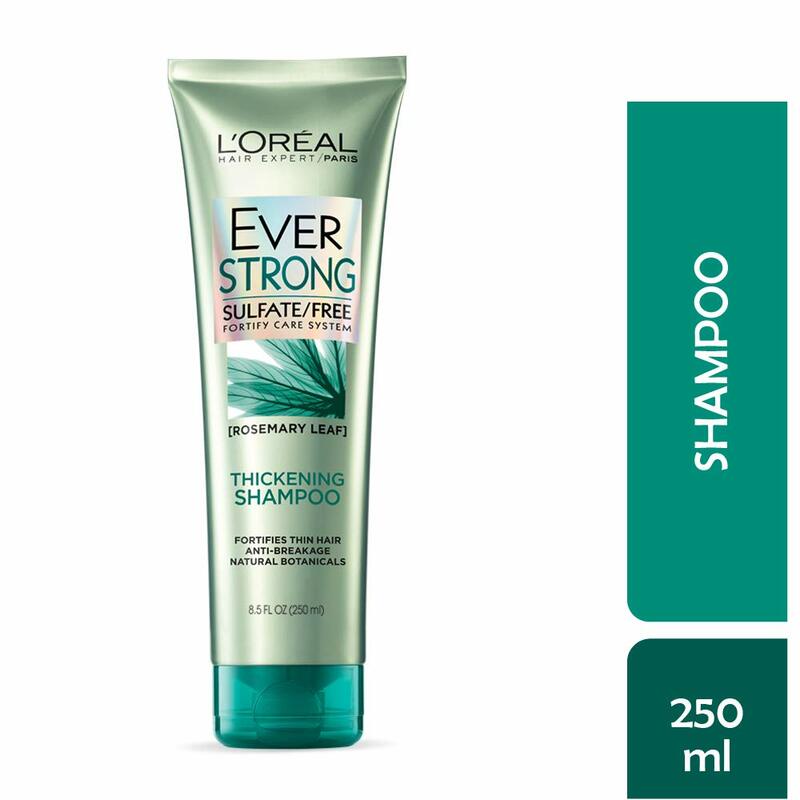 One of its superb products is its EverStrong Thickening Shampoo. L’Oreal has been in the industry for more than a century. It knows its products and it knows what its consumers need. From shampoos to conditioners, L’Oreal continues to create state-of-the-art hair care fit for everyone. The EverStrong Hair Thickening Shampoo is a highly recommended anti-hair loss product. It’s 100% sulfate-free. There are no harmful chemicals or strong salts built to damage hair. It only has the high-quality ingredients made to deliver a brighter and better hair. It’s infused with a fresh aromatic fragrance that is long lasting. It won’t matter if your scalp perspires, the fragrance will still remain. The rosemary leaf adds a feminine and fresh aromatic experience for any user. If there’s anyone wondering if the product was tested on animals, it’s great to say that this is 100% cruelty-free. No animals or animal by-products were used in the making of this one-of–a-kind shampoo. L’Oreal has ethical values concerning animals, so none of them were treated unfairly. 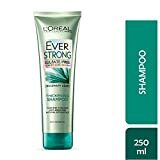 If you are searching for an affordable and effective way to battle against hair loss, then you might try L’Oreal’s EverStrong Thickening Shampoo. It’s a shampoo designed to strengthen the roots of the hair and give each strand a thicker and stronger feel. Hair quality will improve, along with its management. The fragrance might be a bit too strong for some people, but that’s a matter of preference that doesn’t necessarily affect the overall quality of the shampoo. It’s best to note that shipping should handle it with care so as not to damage the container. For best results, use EverStrong Thickening Conditioner to get that guaranteed moisturized hair. A tale of hard work and the desire to support hairdressers and provide high-quality hair care products is what Paul Mitchell is all about. One of the most renowned brands of hair care, it has produced a one-of-a-kind thickening shampoo. Paul Mitchell Lemon Sage Thickening Shampoo is a shampoo that works wonders for anyone. Produced for professionals by professionals, Paul Mitchell Lemon Sage Thickening Shampoo is infused with natural ingredients made to strengthen and moisturize hair. Dry, coarse, thin, hair will find a new life with this shampoo. It’s designed to make all hair types thicker and stronger. It doesn’t matter if hair is straight, curly, or colored, the shampoo will help repair it. The zesty formula with lemon sage adds a refreshing scent to anyone’s hair. It rejuvenates the scalp and gives strands a thicker texture. It’s also great to know that the shampoo works well with adding volume and body to the hair. The lemon sage shampoo isn’t only going to make hair thicker, it’s also going to make it look better by making it more voluptuous. It has thickening agents ready to boost volume and panthenol that’s made to add strength. This cruelty-free shampoo is recommended for anyone who wants to change his or her thin hair. It has natural ingredients formulated to fight the effects of hair loss. Paul Mitchell Lemon Sage shampoo is one of the best thickening shampoos. It’s deliberately designed to make hair cleaner, shinier, and thicker. It’s a great product for anyone who’s suffering from hair loss. Hair loss can be cured with the constant use of this amazing shampoo. It isn’t as affordable as everyday shampoos, but that’s because it isn’t just a regular shampoo. It’s a special thickening shampoo that works on all hair types. Anyone who wants to get his or her hair growing again will benefit from this effective product. Your hair will feel more refreshed and revitalized with the Paul Mitchell lemon sage shampoo. It’s fresh, functional, and fragrant. A quick and easy way to give hair volume and thickness is a hair regrowth shampoo. It’s an effective way to counter hair loss and make hair grow again. 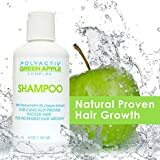 Polyactiv Green Apple Complex Hair Regrowth Shampoo is a shampoo that isn’t only designed to make hair grow again, but also gives it a clean and glossy exterior. 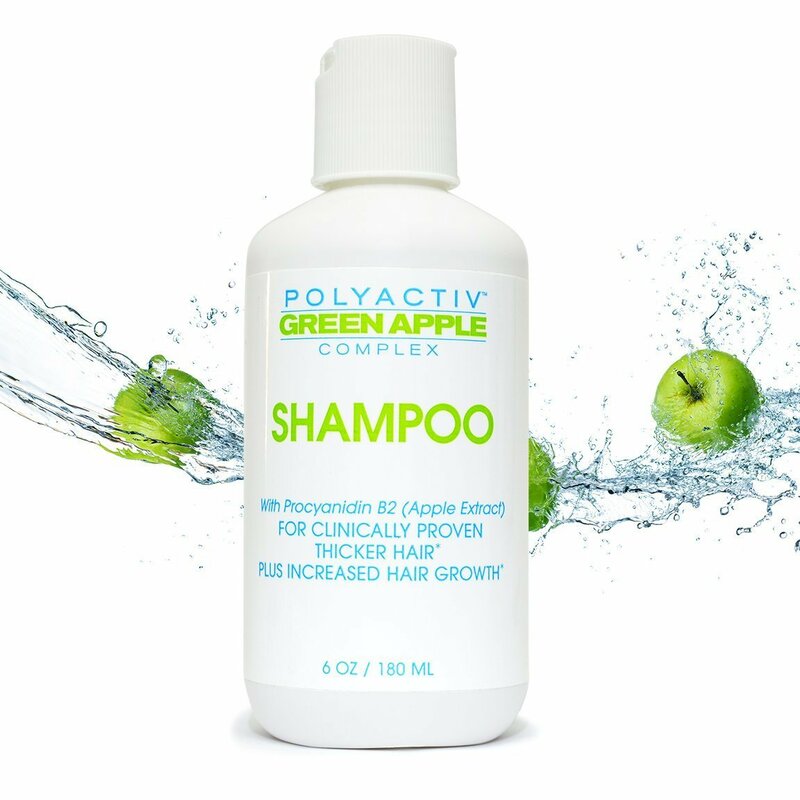 One of the best things about Polyactiv Hair Regrowth Shampoo is its fantastic green apple fragrance. Nothing smells more refreshing than the scent of green apples! However, green apples aren’t only used in producing the fragrant smell of the shampoo. The nutrients from the fruit are also used to create a rich, rejuvenating formula. Hair regrowth can be achieved with this effective shampoo. It has a number of ingredients that can aid in hair regrowth. The active ingredient Procyanidin B2 found in green apple peel extract is infused with Jojoba leaf, grape seed, rosemary, sage, and Aloe Vera to make hair thick and moisturized. Each strand of hair will feel the effects of these amazing ingredients! It doesn’t contain harmful chemicals and all its ingredients are FDA-approved, making it a trusted and reliable hair product. This clinically-proved hair regrowth shampoo could make any hair thicker and more voluminous just after a few washes. It won’t take long to see results; you’ll need just a few uses before significant changes will appear. A fast way to grow hair is through this excellent shampoo. Polyactiv Hair Regrowth Shampoo offers a fabulous fragrance fit for every hair. It’s wonderful to take a whiff out of that aromatic smell. Hair will not only smell great, but it’s also going to feel amazing. People who are searching for a way to thicken their hair will find joy with this Green Apple Complex Shampoo. It’s filled with active ingredients that are safe for hair. The price may make people hesitate, but the effects it produces can make people wonder why they hesitated at all. The leading brand in hair care healing is none other than L’anza. It aims at producing the most technologically advanced products to counter hair damage and loss. L’anza Healing Volume Thickening Shampoo is a prime example of what anyone needs to heal hair. L’anza Thickening Shampoo is a gentle formula that’s safe to use for an everyday wash. It has active ingredients designed to increase the diameter of each hair fiber from within. Hair isn’t only going to look thicker, but it’s going to feel thicker too. Hair strands will be stronger because of the amazing Keratin Healing System. It has a lot of features that contribute to the overall health of hair. It has organic bamboo extract and Gugo bark that gives hair more body and volume. Hair won’t have to go through sudden hair loss because of its proven effective ingredients. This amazing hair thickening shampoo contains no harmful chemicals that could diminish hair of its natural gleam. It has no parabens or sulfates, just natural ingredients made to improve hair. The shampoo works for all hair types and is best used together with its conditioner. An excellent way to heal hair is through use of L’anza Thickening Shampoo. It has advanced features that make each strand thicker and stronger. It’s formulated with L’anza’s renowned Healing Keratin System to assure that healthy and healed hair. Hair will be shinier and stronger with this healing shampoo. Anyone who wants to fix his or her hair and return it to its natural glow should try using L’anza’s thickening shampoo. It’s a formula designed to repair, revive, and regenerate all kinds of hair. The search for the best hair thickening shampoo to combat your thinning hair can be a long and confusing journey. Not all hair is created equal, nor its response to products and treatments. It may take a bit of trial and error before finding the best thickening or regrowth product for your thinning hair. Remember, eating foods and taking vitamins that promote healthy hair can be very helpful in conjunction with anti-hair loss, thickening shampoos and products. besthairthickeningshampoo.com is here to give you comprehensive, informed product profiles and reviews for the top hair thickening shampoos and regrowth products. We regularly update our site with the most current information and effective products and treatments available to you. So, check back often and let us help you reach your hair nirvana!